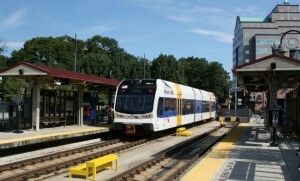 New Jersey has 243 transit stations, ranging from small single-track stations to major multi-line hubs. The unique characteristics of each station, of its immediate neighborhood, and of its surrounding municipality mean that a wide variety of development strategies should be brought to bear in order to maximize each location’s potential. New Jersey Future has compiled from various sources a comprehensive database of development-related statistics for all of the state’s transit stations and their surrounding neighborhoods. Searchable by data element, by station or municipality, or by ranking, the database is intended to provide policy makers, municipal officials and development professionals with a straightforward way to identify the highest-potential opportunities for various kinds of development around transit stations. This dataset offers a unique 360-degree profile of each station, including lines and frequency of service, station-area parking availability, and travel times to New York Penn Station. Available demographic characteristics for the surrounding neighborhoods include population and housing density, median income and home value, and details of vehicle ownership. At the municipal level, employment data is available. 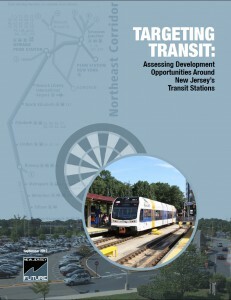 The accompanying report, Targeting Transit: Assessing Development Around New Jersey’s Transit Stations, describes the data included in the database, what it reveals about development patterns near the state’s train and bus stations, and how it might be used in the decision-making process. The report finishes with recommendations, highlighted by analysis of the data, for fostering transit use and transit-oriented development. The data will be useful to state policy-makers as they work to determine how best to target development incentives; to municipal leaders working to revitalize transit-centered downtowns; to private real estate developers seeking information on where certain types of development are best suited; and to employers trying to determine optimal locations for their businesses. New Jersey Future is making available reports based on the data, both by station and by data variable. Organizational members are entitled to certain basic reports at no charge, and additional reports are available for a fee. To inquire about reports, please contact Elaine Clisham (eclisham njfuture org) . New Jersey Future also does regular web-based orientations to the data available in the report. If you would like to be notified when the next demonstration is scheduled, please fill out this form. Targeting Transit Data Dictionary (pdf), which details the items included in the database and explains their significance. Request an online orientation to the data in the Targeting Transit database.